Life has few experiences as euphoric as flight. That exhilarating space between freefall and ascension, take-off and stabilization, where the disembodying force of weightlessness doesn’t so much course as shoot throughout your body creating a literal high as real as any endorphin rush. Gravity Rush, a game from Sony’s Project Siren team that was recently re-released on the PlayStation 4, expertly emulates the exhilarating and frightening powerlessness of this sensation with a creativity that few others games can muster. You play as Kat, a nimble amnesiac who struts above, below, and between the labyrinthine corridors and stacked parapets of a floating city, Hekseville, on a journey of self-discovery and trial-by-fire heroism. Aided by her faithful companion Dusty, a mysterious black cat who combines the reality-bending absurdism of the Cheshire Cat with a living rift in the fabric of the universe, Kat flings herself to and fro across the city. She’s an impossibility soaring over impossibilities, swooping down to aid Hekseville’s citizens against the ethereal force of corruption known as the Nevi. Gravity Rush’s flying buttresses and teetering ramparts are without a doubt owed to turn-of-the-century architecture and aesthetics. But the turn of what century? This is not the Earth we know, though its look and feel are undoubtedly drawn from our own. Among its wide and plentiful inspirations, none is more apparent or essential than that of Jean Giraud, one of the most prolific and paradoxical comic artists of his lifetime. That latter quality is best exemplified by his most famous nom de plume: Moebius, an impossible object that loops back into itself perpetually, a single surface that exists as both one and a pair, and an appropriate symbol for the the diversity and dichotomy of Giraud’s body of work. The trajectory between Moebius’ work and Project Siren’s Gravity Rush is far from circumstantial. In recollecting the game’s protracted development, its director, Keiichiro Toyama, adamantly cited the French artist’s illustrations as the singular inspiration behind its gravity-bending action. Dusty the cat is clearly drawn from the 1978 graphic novel The Eyes Of The Cat, the first of many collaborations between Giraud and writer-director Alejandro Jodorowsky. And even the game’s expository scenes, which take the form of motion-comic interludes, wear the mark of Moebius’ influence proudly on their sleeves, owing as much to him as they do the technical limitations of the PlayStation Vita. Toyama is just one of many voices to praise and take inspiration from Giraud’s word, alongside the likes of Stan Lee and Federico Fellini. But who was Jean Giraud, this man simultaneously known by as many as three names, and how did his influence make its way from the Franco-Belgian comics of the ’70s to Gravity Rush? Jean “Moebius” Giraud Photo: Fondation Cartier Pour L’Art Contemporain. Born in the suburbs of Paris on May 8, 1938, Giraud immersed himself in drawing from an early age. At 16, his talent earned him entry into the Duperré School Of Applied Arts to study comic artistry. Dropping out of his own accord, he embarked on an eight-month sojourn in Mexico, an experience that would profoundly shape the course of his artistic journey. He would then make a name for himself penning serialized Western strips for various newspapers before assuming the artistic alter ego of Moebius in 1975 and founding Metal Hurlant, better known in the U.S. as Heavy Metal, a pulp sci-fi and fantasy magazine through which he’d publish the majority of his most acclaimed and influential stories. The mark of Moebius’ aesthetic is inextricable from Gravity Rush’s magical-realist world and the foundation of how the game plays. It opens with an apple being shaken from a tree before falling down into the bowels of Hekseville and gently rousing an unconscious Kat from sleep. She has no idea where or who she is, her first instinct being to stare upward through the criss-crossing industrial detritus that decorates the depths of this city and up into the sky. The implications of this scene, of Kat somehow having fallen from a great height into this strange new world, recall an iconic Moebius illustration from the opening moments of his 1981 comic The Incal, wherein the series’ protagonist, Jon DiFool, is hoisted over a high-rise overpass by mysterious assailants and seemingly thrown to his death. This single panel could reasonably be considered the spiritual blueprint for how Gravity Rush toys with height and velocity. (Gareth Damien Martin recently explored this connection and the game’s debt to Moebius’ architectural storytelling in an article for Kill Screen.) How can a game replicate the fear and ecstasy of flight? 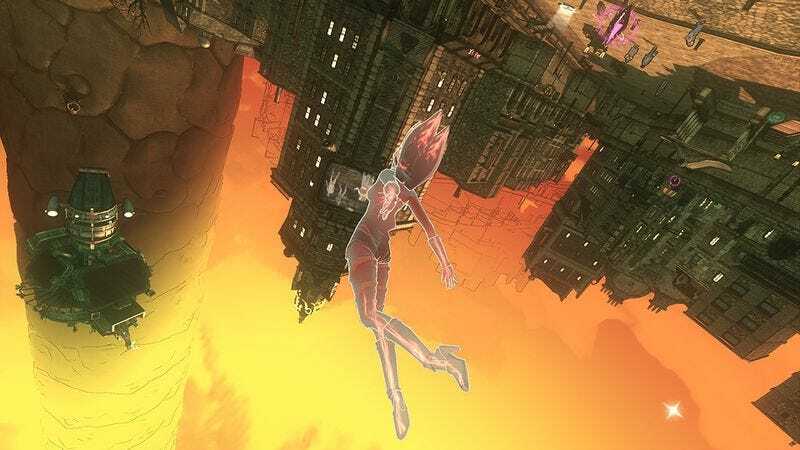 Gravity Rush’s answer is to give players the power to control gravity, selectively suspending and reassigning Kat’s gravitational field so she can scale the side of buildings with ease or soar across the sky with reckless abandon. The titular rush of vertigo creates an incomparable feeling of flight. This lineage from Moebius to Gravity Rush is itself just another instance in a history of aesthetic and ideological exchange between two communities of artists otherwise separated by geography, nationality, and language. Europe and Asia have long been aesthetic bedfellows, perpetually pining for a star-crossed rendezvous. Look no further than Jean-Pierre Melville’s crime drama Le Samourai, particularly Alain Delon’s turn as contract-killer Jef Costello, whose sartorial stoicism helped shape the fashion trends of mid-’70s Hong Kong. A more recent example of that cultural cross pollination is Range Murata’s character and mechanical designs for the anime Last Exile, which are inspired by first-generation aeronautics and the authoritarian tumult of World War II. The exportation and publication of the works of Moebius and his contemporaries created a silent yet seismic shift in the developing visual language of manga. The list of Moebius’ Japanese admirers is nothing short of a who’s who from the canon of popular Japanese art and animation. Katsuhiro Otomo, the creator of Akira, cited him as an inspiration. Katsuya Terada, Jiro Taniguchi, Naoki Urasawa—an entire generation of up-and-coming artists either claimed Moebius’ work as a milestone in their personal growth or had the privilege to name him as a peer. Even Osamu Tezuka, the godfather of anime, greeted him with respect and adulation. Moebius and Hiyao Miyazaki at a joint exhibition. Photo: Amal FM / Flickr. None of those associations is more storied than Giraud’s friendship with renowned anime director Hayao Miyazaki, whose original manga and, later, motion picture Nausicaä Of The Valley Of The Wind draws from Moebius’ landmark silent comic Arzach. Published in the first issue of Metal Hurlant, Arzach was the story of a nomadic sky-surfer soaring through the plains of an alien world on the back of a white winged creature—not unlike Nausicaä’s protagonist, and only a few degrees removed from Gravity Rush’s hero, Kat. In 2005, Moebius and Miyazaki would consummate their long mutual admiration of each other’s work with a joint exhibition held in Paris. But the final, most apocryphal note of their correspondence is without a doubt the most legendary. Stirred by Miyazaki’s film, Giraud named his daughter after the strong-willed and open-hearted Nausicaä; a daughter who, rumor has it, is able to claim one particularly famous animator as her godfather. Jean Giraud the man died on March 10, 2012, following a lengthy bout with cancer, but Moebius, the artist, continues on as infinitely as the circuity of his namesake. His presence is made known throughout the entirety of Hekseville, every hue and surface coauthored by way of his influence. It’s not hard to imagine him far off somewhere, content in the knowledge that his memory endures and his legacy remains intact, a gentle presence cradling the player’s every clumsy fall and vaulting their every victorious ascent.